Canadian soprano Kathryn Domoney has earned praise for her “beautiful, round and flexible voice, excellent diction and wonderful stage presence.” A Graduate of the University of Toronto and former member of the Canadian Opera Company Ensemble Studio, Kathryn has performed a variety of operatic roles ranging from the baroque era to the twentieth century. Highlights include Nella in Gianni Schicchi Metropolitan Opera Guild, New York, Belinda Dido and Aeneas Opera Atelier, Marzelline in Fidelio Tryptych Productions, Toronto and Anna in The Merry Wives of Windsor, Opera in Concert. With the Canadian Opera Company, Kathryn created roles in Somers’ Mario and the Magician, Alexina Louie’s Scarlet Princess and was the Hen in Cunning Little Vixen. 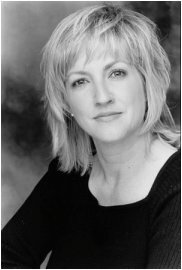 On the concert stage, Kathryn has appeared with many of Canada’s leading orchestras, including Kingston Symphony Bach’s Christmas Oratorio, Niagara Symphony St. John Passion, Tafelmusik Baroque Orchestra Messiah, the Elora Festival Carmina Burana, Elijah and the National Arts Centre Orchestra Dona Nobis Pacem, Vaughan Williams. Recent engagements include Messiah with the Elmer Iseler Singers, Dvorak’s Stabat Mater with the Cellar Singers of Orillia and Haydn’s Lord Nelson Mass with Hamilton’s Bach-Elgar Choir. She has appeared frequently as a guest artist with Toronto’s distinguished Aldeburgh Connection, and appears on their 20th Anniversary CD. In 2004, Kathryn presented a recital for the Mozart Recital of Toronto, and returned to Kingston Symphony for Messiah. With Elora Festival Singers, Kathryn was guest artist in both Messiah and Bach’s B Minor Mass. In March, 2005, she sang Schubert’s Mass in A Flat with the Toronto Classical Singers. The 2005/06 season included appearances with the Ottawa Choral Society in Mercure’s Cantate pour une Joie, Messiah with Guelph Chamber Choir as well as Hamilton’s Bach-Elgar Choir. Kathryn performed in Vaughan Williams’ Serenade to Music with St.James Choral Society and in May presented a duo voice recital with contralto Maria Soulis, which featured two commissioned works by composers John Beckwith and Christopher Donison. Highlights of the current 2006-07 season include Bach’s Magnificat and Vaughan Williams’ Hodie with Mississauga Choral Society, Messiah with Victoria Symphony Orchestra, and John Rutter’s Requiem and Mendelssohn’s Hear My Prayer with Karen Schuessler Singers in London, Ontario. Victoria audiences have another opportunity to hear their hometown soprano as Kathryn returns in May 2007 for Mozart’s Coronation Mass and Beethoven’s Choral Fantasia with the Victoria Symphony Orchestra. In addition to her performing career, Kathryn Domoney teaches voice and presentation in masterclasses for emerging singers and adjudicates voice classes in Music Festivals across Canada. Visit www.stagestyle.com for more information.